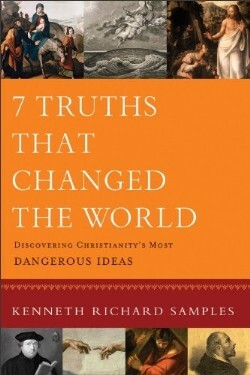 Book Review: “7 Truths that Changed the World” by Kenneth Samples | J.W. Wartick -"Always Have a Reason"
Kenneth Samples’ latest book, 7 Truths That Changed the World (hereafter 7TC) provides an easy-to-read, fairly comprehensive apologetic for the Christian faith in a unique format. Not all men stay dead. In this section, Samples defends the historicity of Jesus’ resurrection. Christians who are actively involved in reading apologetics will find that the argument is the fairly well-known “minimal facts” style, but Samples does manage to give some uniqueness to the argument in the next chapter, wherein he examines various objections to the argument for the resurrection. Particularly unique was the fact that Samples takes the time to offer critiques of some of the more outlandish objections, like the twin brother theory (38). God walked the earth- Here, Samples puts the “dangerous idea” squarely in the context of religious pluralism. Not all religions can be true (48ff) and if Jesus was God on earth, then Christianity is true. Interestingly, rather than simply presenting arguments for Jesus’ Godhood, Samples offers a few theories of the incarnation and only then moves towards Biblical evidence for Jesus’ deity (50-53; 53ff). Again, Samples engages with some little-known but often abused objections, including the notion that Jesus was a guru (69-70) or even an alien (70-71). A fine-tuned cosmos with a beginning- Samples then engages in an argument from cosmic fine-tuning. Again, Samples puts the argument into a context rather than simply throwing it out to be fielded. Throughout the book, Samples grounds the arguments he makes within the broad theological history that surrounds the ideas. For this argument, he points out the historical doctrine of creation out of nothing through the Bible and church history (78-80). He also points out the “weighty theological implications” of the fine-tuning argument (82-83). He then argues that Christian theology helped ground the emergence of science (91ff). Clear pointers to God- Explanatory power is one way to evaluate worldviews, and Samples weighs atheistic naturalism against Christian theism. Samples offers a method by which people can evaluate worldviews. Essentially, this is a summary of his excellent work, A World of Difference, which I comment on in my post “Can We Evaluate Worldviews? How to navigate the sea of ideas.” Throughout this section, Samples offers a number of arguments in favor of the notion that God exists and can best explain the universe we observe. Not by Works- One of the core tenets of Protestantism, and indeed of evangelicalism (and in many ways, more modern Roman Catholicism) is salvation by grace. The fact that Christianity offers salvation as a gift provides another way to analyze it in light of other worldviews (134ff). All humans feel an urge to try to work for salvation, but this is mistaken. Ultimately, we cannot do it by ourselves (136ff). Sin is a predicament in which we find ourselves, it is a condition (137-138). Thus, Christianity offers a “way out” by salvation through grace in Christ. Humanity’s Value and Dignity- Humans have value. Most humans realize that it is wrong to cause harm or suffering and that certain virtues are good. However, without theism, there is no basis for human values (167ff). Some atheists have realized this and rejected meaning (163-166), but their worldviews dim in comparison to the light Christianity brings. The Good in Suffering- The problem of evil is the most oft-trumpeted argument for atheism, and Samples responds to it mostly by utilizing the “greater good” theodicy (theodicy means, basically, a defense from the problem of evil). First, he points out that it is not logically incoherent to suppose God is all powerful and all good while still believing evil exists (196-200). Then, he argues that God can have good purposes for evil and suffering (205ff). While we may not come up with a specific reason for every single evil that occurs, God’s sovereignty ensures that good will triumph and that all things work for His purposes (209ff). I don’t tend to favor the “greater good” theodicy because I’m not sure I can swallow the notion that every evil has a greater good–but I think that when applied to evil generally it may be more powerful. Samples does a good job introducing the reader to the basics on the problem of evil and a theodicy here. While much of the material in 7TC goes over things the avid reader of apologetics will have encountered, the novelty of some of the arguments as well as the answers to some infrequently-considered objections makes the book worthwhile even to “veterans.” It is also very helpful to have some of the background in historical theology that Samples gives to contextualize many of his points. These kinds of extra details with the overall argument give readers a level of background knowledge that not all introductory apologetics books can provide. Moreover, the format makes it work well as the kind of book to hand to a skeptic or a believer with doubts. It presents the core doctrines of the Christian faith in their broad contexts and defends them admirably. While hardened skeptics may laugh a book like this off, for those with open minds the arguments will be compelling enough to start conversations. Due to the effort to make the book readable for a general audience, it is clear that Samples can’t touch on every objection, but it will get readers thinking. Overall, 7 Truths That Changed the World is a superb effort by a fantastic scholar. It presents a reasoned defense of the whole of Christianity in a short, digestible form that makes it perfect for an introduction to apologetics or as a book to give friends to start conversations. Not only that, but Samples provides enough unique insight to make it worth a read by even “veterans” of apologetics literature. It comes recommended highly.